Way back at the beginning of 2017, the year started with a bang for me and has carried on that way ever since (so much excitement but more on that another time!) . In very early January, Katie of Ponderosa and Thyme and her lovely husband Mark came to stay for a couple of days. Both still jet lagged I don't know how they were so sociable, but it was a lovely time spent getting to know the person (well, people) behind the social media accounts where I have to admit I do stalk her a little bit! Katie is one of my absolute favourite designers, a real artist, who paints with flowers. We had some lovely conversations over food, wine and many dog strokes! We wandered around my desperately sad garden (it was early January and we were mid re-design so it was at it's absolute worst!) 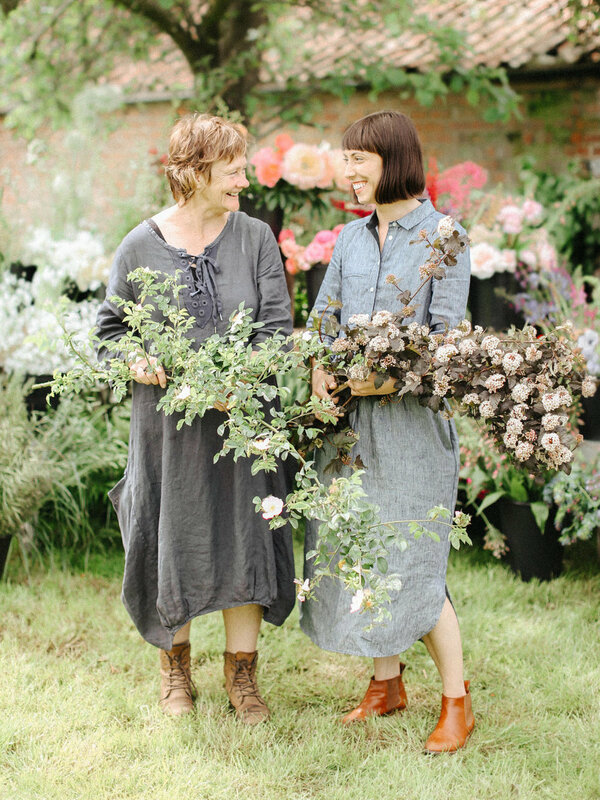 and chatted about all things floral, how we got where we are now, our influences, loves, worries etc. Whilst chatting over dinner we took a last minute decision to make an early morning trip to the local flower market for a wander round and just buy whatever flowers we fancied to create something, just because we could. So next morning, Katie drifted around the market looking blummin' gorgeous on about half an hours sleep while I looked like the living dead. We opted for all sorts of pretty bright colours, including these VERY pink lisianthus, cyclamen and begonia and got everything nicely drinking. We then set to work. I dithered for a while between whether to make a huge urn or a bouquet and eventually settled on a bouquet. Just before Katie and Mark left, we headed back inside for some picture taking, Katie managed to capture this lovely image of me (believe me, I don't say that often!) and I now use it as my profile picture for all social media platforms. So, I'm sorry it has taken so long to actually post about our lovely time together. It really was a pleasure. I have said it in other places, but I do feel Katie and I are very similar people, with a similar ethos on life and it's all thanks to social media that we met - go Instagram!